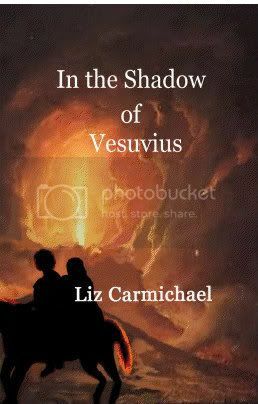 Today I am here with a review of In the Shadow of Vesuvius by Liz Carmichael. If you are interested in reading it, head to Amazon between July 2nd-4th for free! Vesuvius is Awakening. Mira, a fifteen-year old slave who saw the coming death and destruction in a vision. Now it is time to fulfill the vow she made to the mother of the Roman child in her care. To do this, she must escape the watchful eye of the slave ordered to guard her, and the stubborn father who refuses to believe there is any danger. Before Mount Vesuvius erupts and buries the town, she has to convince her guard to go with her or suffer the fate of Herculaneum and all who have not yet fled to safety. Seeing his neighbours leave, her owner decides to join them, but first he will make sacrifices to the gods. To Mira’s dismay he takes them to the temple farthest from the best escape route. Mira thinks about killing the slave keeping watch on her, or even better the child’s father, then they can all run from the certain death she knows is on its way. But can she commit murder, even if to save the life of the child she loves? In the Shadow of Vesuvius takes you back to a horrific event from history through the intriguing adventure of a young slave. The story is fast-paced and keeps you wanting to know who survives. The story flows at a quick pace and although the plot is pretty intense, it doesn't linger on some of the devastating moments. Liz Carmichael executes this in such a way that Mira doesn't appear dismissive, rather she is deeply compelled to protect the child in her care. She looks out for his needs first, telling herself not to waste time thinking about things that she cannot control. She is a very strong and determined character. Furthermore, it is highly engaging. The suspense of wanting to know what happens to Mira and her little entourage keeps you reading. As a historical event, we know how things end at Mount Vesuvius, making this story all the more engrossing - does Mira share the same fate as so many others? Or does she manage to escape? In the Shadow of Vesuvius is a wonderful and enjoyable read. It is easy to whizz through and keeps you on the edge of your seat throughout. I recommend giving it a try! Maybe 'cause I learned about the whole eruption that it makes it more interesting?